The Hardest Goodbyes II | Expressions of my life - An evolution of art. 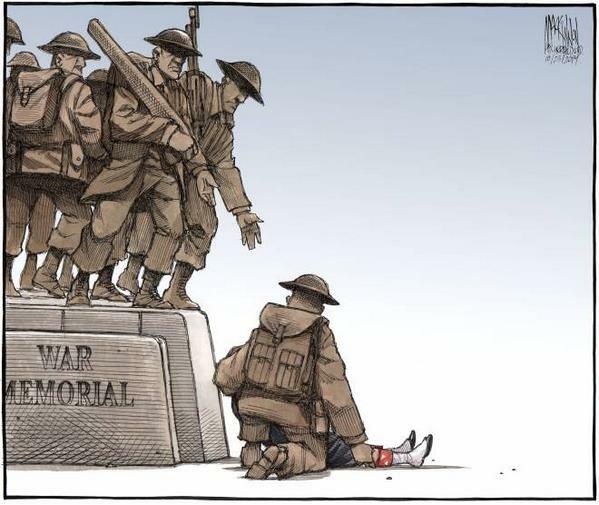 This cartoon, published in The Chronicle Herald, resonated widely in Canada and around the world. It spoke to me because like many in this small Capital, we feel Cpl. Cerillo’s loss on a deeply personal level. The import wasn’t lost on me when I saw the photos of him standing guard just moments before the shooting and the photos moments after; as he lay surrounded by First Responders. He was guarding the World War I face of the monument. My Great Grandfather Tupper was KIA at Ypres and my Great Grandfather Thomas wounded at Passchendaele. For that reason, I find this image comforting in a small way.